Manhunter! No, not the Martian Manhunter, and not the Green Lantern's robot Manhunters. This Manhunter is Mark Shaw, a disillusioned public defender who brings criminals who have escaped the system to justice, and will be played by Medium's David Cubitt. 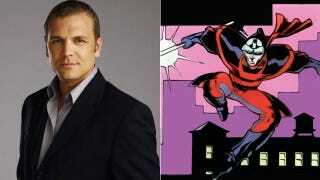 This Manhunter was once part of the Suicide Squad, so it's entirely possible he'll be joining their ranks in season 3. Any one want to place any bets on the next DC character to join the Arrow-verse? I kind of hope Catwoman makes it, so we can get the Birds of Prey party started in earnest.